A trio of solid, black granite polished spheres with white LED lights. This feature should not be mistaken for a hollow terrazzo reproduction as it is produced from solid granite and will therefore last for years to come. The included piping, pump and 3-way water spider allow you to adjust the water flow for each sphere individually, creating outstanding visual effects. Cut and hand carved from natural stone, each of these water features is truly unique. 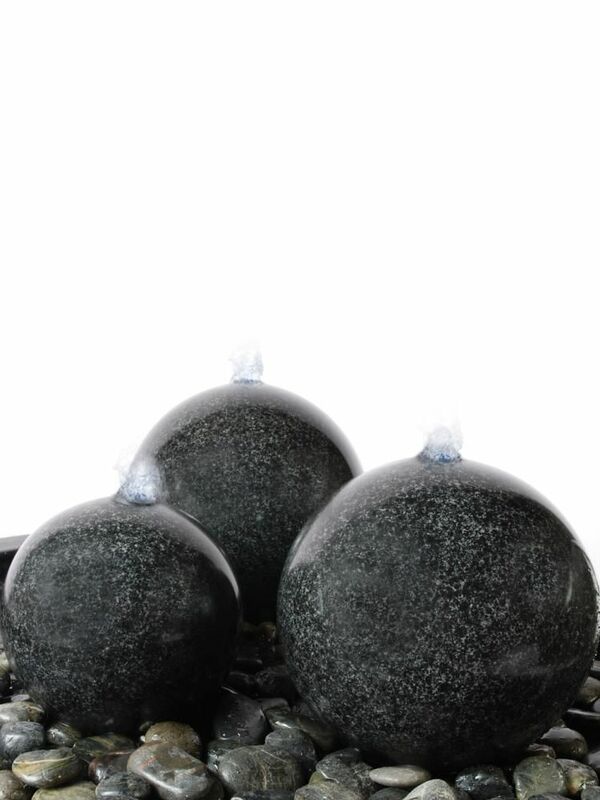 This kit includes a heavy duty pebble pool and polished black river cobbles. Mains water pump with 10m cable and 3-way water spider. Granite Trio Water Feature Kit - customer reviews. 13 Jul 2015 SPECIAL OFFER - Granite Trio Water Feature Really pleased with the items purchased. Delivered in good time. 21 Aug 2014 SPECIAL OFFER - Granite Trio Water Feature Although it is not yet set up and working, the general appearance and design are better than I expected. "Good value for money. Quick delivery"
"Took 3 days to deliver. Polished stone spheres are beautiful"
"Good price. Simple to install. Friends are now very envious!" "Amazing value for money. A1!" "Product arrived next day. High quality granite balls, easy to install. Now looks great in garden. We swapped a terrazzo 3 sphere water feature from Ubbink for this feature as the terrazzo feature was hollow and didn't look natural enough. This granite feature looks amazing." "Next day delivery, great fountain. Bought extra river stones and they really set the feature off perfectly." "Solid stone water feature with really bright white lights. Looks the part on a night as the water flickers out of each sphere." "Good service prompt delivery. Easy to install and looks very effective on our decking. Very pleased with product." "Fast delivery, lovely solid stone balls. As it's natural granite stone, it's great value for money as the feature is so heavy." "A Good products from an excellent supplier. The stones in the first delivery had some blemishes, which were very quickly replaced the next day. An Excellent supplier and nice products."